As a result, it has been decided that, subject to on-going favourable weather conditions, League Challenge Trophy competitions will be introduced at this stage at certain age-groups. Matches will start as from Sunday 7th February. HOWEVER – as previously advised, this will be reviewed again in mid-February and again in mid-March and additional trophy competitions will be added at each of those times as appropriate; including, if necessary, further competitions at the age-groups already set. The terms and conditions of playing are as set by the Management Committee, in accordance with Rules. Full details will be sent out shortly but, in summary, each team will play the other in their ‘Group’ (home or away at the sole discretion of the League Fixture Secretary, or both home and away) – with progression to the next knock-out rounds. These knock-out rounds will be played and extra time and penalties decide the winners (except in the final tie where no extra time will be played and penalties will decide the winners). If weather conditions deteriorate (or do not improve) in the coming weeks then, under Rules, the League Management Committee reserve the right to cancel any of the competition age-groups or to withdraw any team or teams from the competition at its sole discretion. This decision, if taken, is final and binding. League and League Challenge Cup matches will always take precedence in this decision process. Marking a referee's performance is a vital part of the match day procedure. This information is used to assist with match officials' training and future appointments. With winter weather on the way, the League is keen to remind club officials of the procedures that need to be followed when the fitness of a pitch is in doubt. It is inevitable that some games will be postponed, but the guidelines aim to ensure as many matches are played on the scheduled day as possible. If, despite all efforts, a game is off the guidelines ensure the postponement is properly recorded. The Football Association has issued guidelines for parents and others wishing to photograph children playing in youth matches. Following questions asked by several clubs when reporting their results, please note the provisions of Rule 11(b) concerning communicating your result on the day of the game. The HOME club must report the result of all League and League Cup games - this includes matches which appear on the fixture list but which have been postponed for whatever reason (weather, county cup tie, inability to raise a side etc.) Away clubs are welcome to do so, but are not required to. In addition all clubs, whether home or away, must report county cup results or, again, matches which have been postponed. In all cases remember the age group and division and always report the home team score first - even if you are the away team. The deadline in all cases is 5.30pm on a Sunday. The FA has announced the winners of its 2012-13 Respect and Fair Play Awards, with their most prestigious individual honour being bestowed upon Andy Lowe – Chairman of the Harrow Youth Football League. From a record number of 470 nominations across the national game, the winners across ten categories were invited as guests of The FA to Wembley Stadium to collect their prizes at The FA Cup Final between Manchester City and Wigan Athletic. Andy has been named as the recipient of the Bobby Moore Award, which is open to people who have made a significant impact on the game. 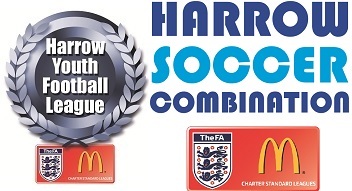 Andy Lowe is the driving force behind the Harrow Youth League and the Harrow Soccer 7s Combination. What marks Andy out is not only the size of these leagues which involve 600 teams and 10,000 players in the age range seven to 18 but the way in which the League and clubs have embraced Respect. In the last five years the leagues have experienced growth of 11-13% year-on-year and the positive way in which the leagues operates the Respect programme is frequently cited as the reason that clubs wish to join or remain in the League. This ethos has only been achieved through Andy’s voluntary commitment of 45–50 hours a week to ensure the close interaction of those that manage the league, its member clubs, managers, players and referees. This results in Andy attending up to eight games every weekend. He does not however shy away from dealing with difficult matters. For example in January this year after reports about the behaviour of the parents of a particular team Andy attended their next match and asked to meet with all parents before the game to reinforce the requirements of the league. Andy’s work is well received by the 250 referees of the League which results in 98% match coverage - a remarkable figure for such a large youth league. Andy’s achievements are also attracting attention elsewhere and he recently hosted a Dutch camera crew keen to take lessons from Middlesex back to the Netherlands. Please remember you MUST report your result by 5.30pm.